Painswick to Slade via Harefield Beacon. 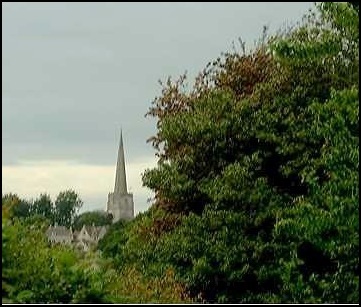 I don’t think I had ever been to Painswick before, and if I had, I certainly don’t remember doing so. But in the early morning sunshine it looked very pleasant, and along with Mick and Larry, who were on this days excursion, I admired the church of St Mary and the churchyard with 99 yew trees that surround it (legend has it that the 100th won't grow). Our route. However, as I'm no cartographer, some elevation detail may be suspect. N.B. From our starting point in Painswick we went ant-clockwise. However, we did not have time to linger. 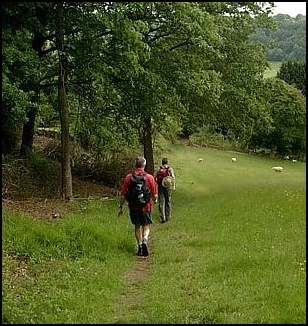 We had a walk to do and soon we were on the Cotswold Way, leaving the town behind, as we went westwards towards Edge. Initially it was easy going across fields and through woodland, but, on reaching Edge, we had some uphill work and with the sun beating down on us this was certainly no easy morning stroll. However, the ascent gave us some wonderful views back towards Painswick and after passing some old quarries walking became easier as our path went downhill. Larry and Mick "posing" on the hillside above Edge. The Cotswold Way continued westwards below the north side of the wooded ridge that we followed until we ascended onto the ridge at Harefield Beacon. Surprisingly this ascent was not as difficult as expected, and, on reaching the Beacon, we were rewarded with good views, a sit down and a late morning snack. 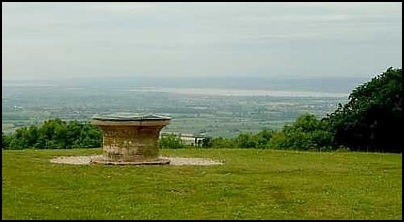 The views were not unlike those we had enjoyed from Stinchcombe Hill on our Dursley walk, with the River Severn glittering in the sun to the west. We then started eastwards on the south side of the ridge, which was more exposed than the route we had taken on the north side. 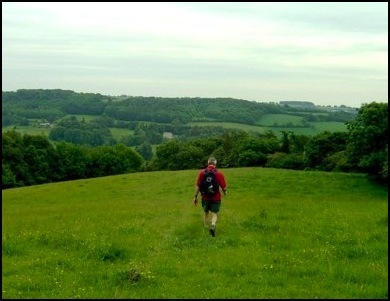 Soon we were approaching the topographer (GR SO 827083), located just off the Cotswold Way near the Shortwood Car Park. 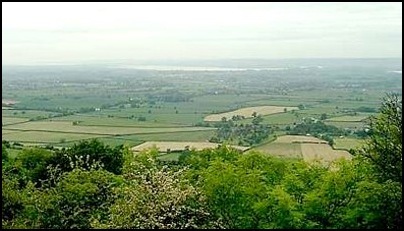 Here were magnificent views over the Severn Valley. We could see for miles. The topographer near the Shortwoods Car Park and more views of the Severn Valley. Back on the Cotswold Way, we passed through the Shortwood Car Park, and went into woodland, where we missed the path we wanted that would have taken us left. However, this was of no real concern and shortly afterwards, having left the Cotswold Way, we did a short stretch of road walking to the junction of three lanes called "Bird in the Hand" ( GR SO 838081). 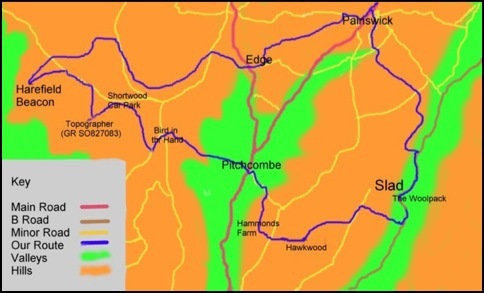 From here, we followed a track going close to Harefield Farm that took us south east, and downhill, to Pinchcombe. We were now at the bottom of the Painswick Valley and although our objective, Slad, and the Woolpack Inn, was not far away there was this great big hill in between. I remember remarking to Mick and Larry that almost all our walks in the Cotswolds never seem to follow contour lines. We always seem to be going up and down hillsides. Very painful on knees, especially old ones. However, if we were to enjoy a pint of best English bitter at the Woolpack the hill had to be negotiated, and this hill was a real toughie. We left Pinchcombe, crossed the main Painswick to Stroud Road, and followed a minor road that went roughly south east. A right turn from this road took us across fields to Hammonds Farm and, after walking south east along the farm drive, we started the “pull” towards the road that went over Wickeridge Hill. 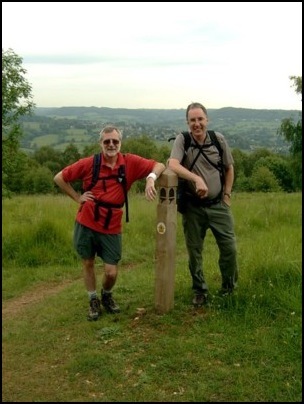 Even Mick and Larry thought it a tough ascent, and when they stopped about 2/3rds of the way up, at a place called Hawkwood, saying it was “so I could catch up”, I think it was really because they wanted a break themselves. Larry in the lead on the path from Wickeridge Hill to the Stroud to Slad Road. Soon after this stop the ascent became easier. Once we reached the road at the top of the hill we went north east along it for slightly less than half a mile before we took a path on our left and went downhill, on the edge of woodland to the Stroud to Slad road. Once the road was reached it was probably only ten minutes before we were in the bar of the Woolpack drinking pints of best English Bitter. Best English Uley Bitter to be precise. Although we were tempted by the menu we still had to get over the side of Wickeridge Hill to get back to the car in Painswick. We therefore decided to get the walk over first and stop at a favourite “watering hole” the pub at Seven Springs and so we made do with a bag of nuts each before continuing our walk. 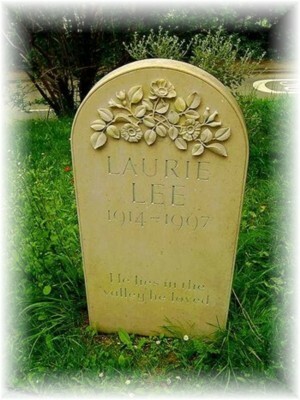 Almost opposite the Pub is the village church and churchyard, which contains the grave of a favourite author, Laurie Lee. Larry, Mick and I first visited Slad with Peter, Ray and our friend Spike back in May 1997. 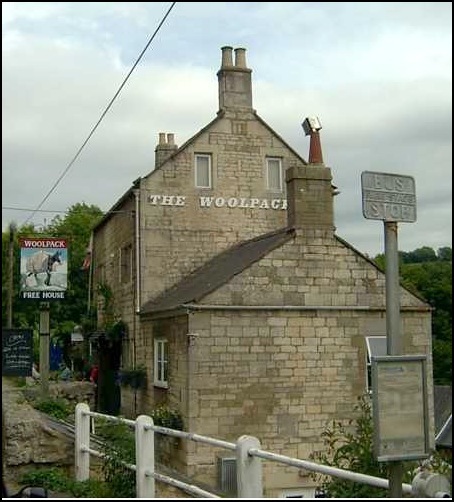 When we planned this earlier excursion I had hoped that we might see Laurie, famous for his book Cider with Rosie, in the Woolpack – a favourite haunt. However, we were too late. He died a few months before our visit so here was at least an opportunity to pay our respects at his graveside. Having left the churchyard we continued uphill (north) out of the village until the village war memorial was reached. Here our path went left up a very steep track and after less than a ¼ mile we turned right onto the wooded slopes of the hillside. Somewhere amongst the trees, we missed a turning on the left – we seem to be making a habit of missing paths in the woods - but we weren’t too concerned as we soon found another track and followed this uphill into Painswick. seen as we approach Painswick near the end of our walk. By now we were getting hungry. Our walking certainly gave us an appetite, so it was back to the car and soon we were speeding on our way to the Hungry Horse at Seven Springs for food and more liquid refreshment. The total distance walked was about 11 miles.